When I was in elementary school, I was pulled out of class regularly for sessions with a speech therapist, for a lisp. I hated leaving my classroom for the private sessions in which I had to practice my “s” sound. The speech therapist was nice enough and I never caused a scene about my dislike for the whole process, but it was–by far–my least favorite part of school. I remember being frustrated that I couldn’t always make the right sounds for her sometimes. Youngsters don’t really have the capacity to understand that certain things are indeed under their control, that if they work hard and keep trying even as they fail, they can eventually reach the goal at hand. I asked that poor woman at the end of every session if we were finished, and it was a new feeling of kid-sized devastation when she enthusiastically replied “No, I’ll see you next week!” each and every time. She had these tiny little plastic teddy bears in red, blue, yellow, and green–the size of dice–in her desk drawer and, if I did a good job that day, I was allowed to play with them for a few minutes before going back to class. I loved those bears, and once she presented that as a motivator, I tried much harder to make the right “s” sound for her. It was one of my first lessons in keeping my eyes on the prize. Eventually my speech therapist finally told me that our work was finished, as long as I “kept up my s’s”. It was a happy day, to say the least. She even gave me one of those bears as a souvenir. Though I rarely think about those days in the speech therapist’s office, sometimes my tongue will “catch” as I speak and I half-lisp. When that happens, I’m back in elementary school for that split second. It’s bizarre, really, because in that split second I can feel all of the childlike frustration of those sessions while being grateful for them simultaneously. Last weekend I was whisked back there once again, with a twist. Jim and I were going through the boxes in our crawlspace and I found a box of old papers from school. 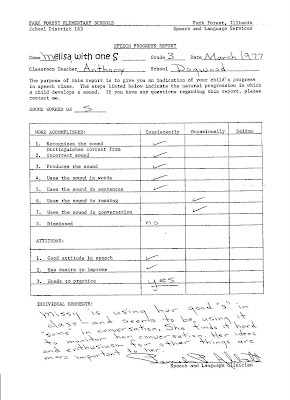 Shoved in the middle somewhere was this, one of my assessment sheets from speech therapy. 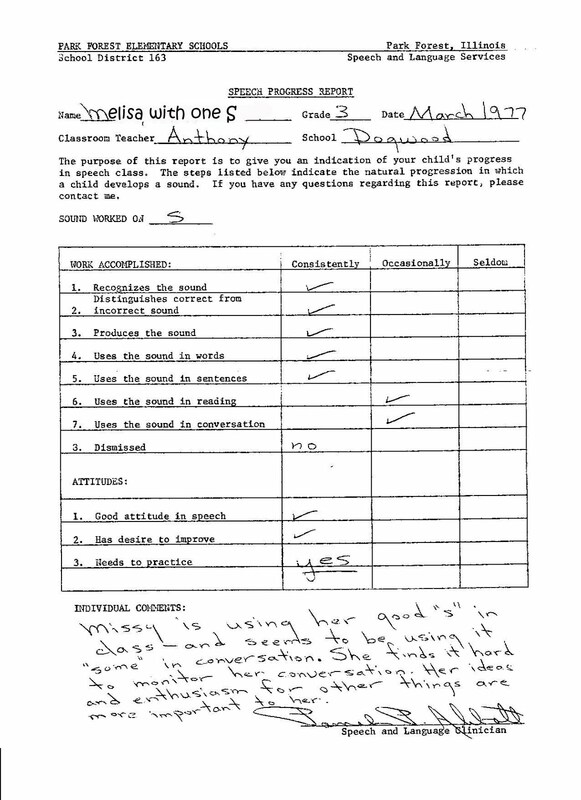 The discovery made me smile, especially the “Dismissed–no” part, and the “Needs to practice–yes“ part (I don’t remember practicing my “s” sounds once I left her office each time: perhaps that was the problem!). What had me all-out giggling, though, was the very telling final line in her comments, which, sadly, sums me up sort of perfectly. Click the picture if your eyesight isn’t what it used to be. Bet you used your "good S" in your name, too, right? Personally, I believe monitoring one's conversation is highly over-rated (also, pretty damned impossible) just sayin'! No WONDER there's only one 'S' in your name. It all makes sense, now. Actually, In March of 1977, 'She' and I were making plans for our wedding, which was to take place in June. my middle son has been going to speech for 4 years now and when he went before he was in school he had the BEST speech therapist and he LOVED going. He still has one that's nice enough but she is much tougher and he often misses out on fun stuff like music or computer time to go. But he had MANY sounds to work on. He's gotten much better but I think the years of speech critic have made he insanely soft spoken. It's frustrating that now that he can pronounce everything well enough to understand…he won't talk loud enough so I can actually hear him. That is of course unless he's doing his own thing and not talking TO someone, then he's crazy loud. Darn kids! She nailed you right on. Looks like at least you are very consistent. It's nice to look back and see proof that when we were coming up there were a lot of teachers that were looking out for us. Good job to your speech teacher for finding things to motivate you to achieve your "good s's" and if you still think about that so many years later, goal achieved. I had the same thought as Lou. Good thing there's only One S in your name. Bhahaha! You do have great ideas and to say you are enthusiastic is an understatement! And I think I have a few of those bears kicking around if you want to play with them. LMAO! That's an awesome comment! Were you blogging in the thirds grade???? Next post: Totally Worth The Two Bucks. Sort Of. Previous post: From "Never Say Never" To "Better Late Than Never"